Those awaiting results of August 2015 Physician board exam also known as medicine licensure exam can find here the full list of passers, top 10 (topnotchers), top performing schools and performance of schools as the Professional Regulation Commission (PRC) and the Board of Medicine released results in 3 working days after the last day of exam. A total of 2,491 out of 2,921 passed the Physician Licensure Examination as announced on Wednesday. PRC administered the Physician board exam on August 15-16 and 22-23, 2015 in the cities of Manila, Cebu and Davao. 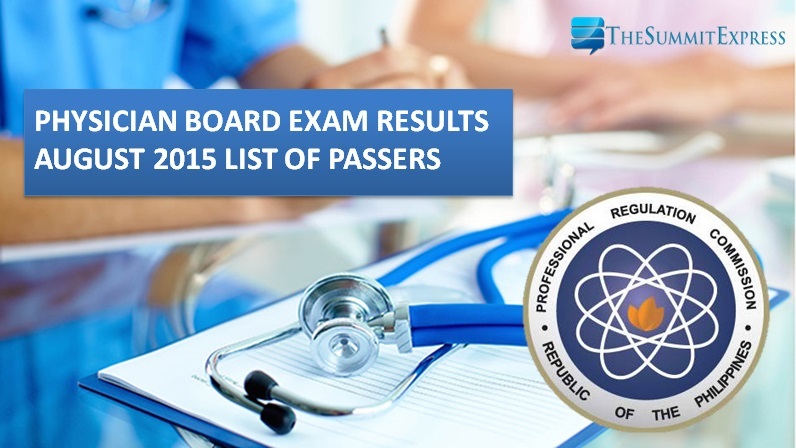 The recent physician board exam covered the following subjects: biochemistry, anatomy and histology and microbiology (August 15); physiology, legal medicine, ethics and medical jurisprudence and pathology (August 16); pharmacology and therapeutics, surgery and opthalmology, otolaryngology and rhinology and medicine (August 22) and obstetrics and gynecology, pediatrics and nutrition and preventice medicine and public health (August 23). On the same period last year, PRC announced results in 4 working days. A total of 2,218 out of 2,730 passed the Physician Licensure Examination. Cebu Institute of Medicine named as the top performing school with 100 percent passing rate. In February 2015 licensure exams, results were available online in just 2 working days. A total of 594 out of 832 named as new doctors. Far Eatern University (FEU) - Nicanor Reyes Medical Foundation edged out other schools with 93.64 percent passing rate.